In this 2013 photo, these men pose with their prize-winning vegetables. 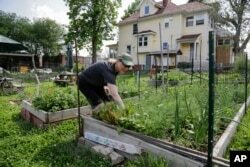 In this 2014 photo, this urban gardener picks herbs from her garden patch at a community garden in Omaha, Nebraska. Gardening can greatly widen a person’s community. First Lady Melania Trump gardens with children at an event in the White House Kitchen Garden, 2017. Scientists say that high levels of cortisol in the body interfere with learning and memory. It can also increase a person’s weight, blood pressure and cholesterol levels. Chronic, high levels of cortisol increase the risk for depression, mental illness and lower life expectancy. Gardening uses many repeated actions, such as weeding or dead-heading (removing dying flowers from a plant). These actions have a calming effect on the brain. The brain is still active but not in the same way that it is, say, when we use computers.